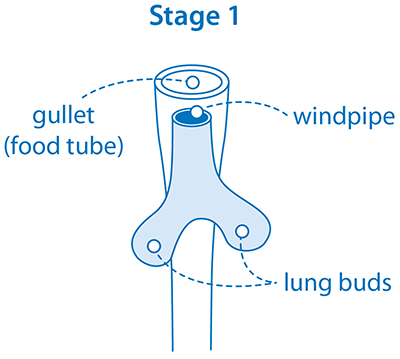 Your child’s lung development is divided into 5 stages. Most of these stages happen in the womb. Things always happen in this order but the exact timings can be slightly different. In the womb the lungs are filled with fluid. Your baby gets oxygen from the mother’s blood. In this stage your baby’s lungs start to develop from the layers of cells that will become the gut. A lung bud develops from a tube called the foregut. This bud separates into two. These two buds will become your baby’s right and left lungs. Your baby makes lung movements in the womb as if they are practising breathing. These movements start at the end of this stage. This is the stage where your baby’s lungs start to develop the tree-like structure you see in adult lungs. Each lung bud starts to divide again and again. At first they form 3 buds on the right side - the upper, middle and lower lobes. They only form 2 buds on the left side - the upper and lower lobes. Your baby’s right lung will be bigger because the left lung has to share space with the baby’s heart. This is the same for almost everyone. These buds continue to divide throughout this stage. They may divide up to 20 times. 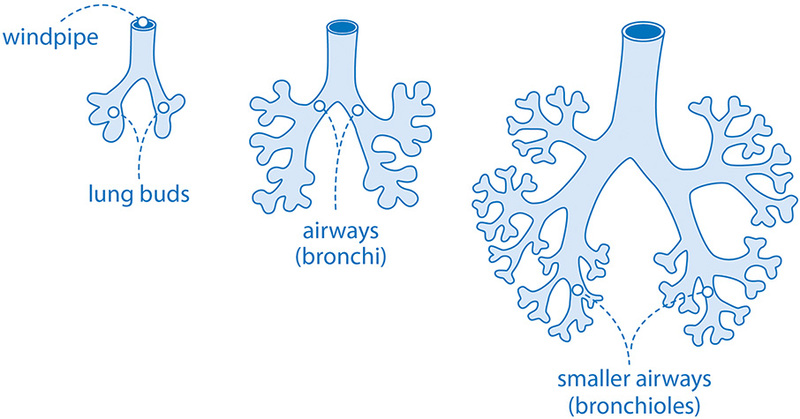 By 16 weeks your baby’s lungs have all of their main airways (bronchi) and smaller airways (bronchioles). Cells that will become the tiny air sacs (alveoli) have started to appear. In this stage your baby will start to develop the air sacs and blood vessels they will need to get oxygen into their blood when they breathe outside the womb. The cells that will become the air sacs carry on developing. Small blood vessels called capillaries grow close to these cells. In this stage growths called sacculi start to grow at the end of the smallest airways. They will develop into air sacs but they don’t look like adult air sacs yet. The walls of these growths get thinner to make more room for air in your baby’s lungs. A substance called surfactant is produced during this stage. Surfactant is a mixture of fats and proteins that will help make sure the air sacs don’t collapse at the end of each breath after birth. In the last few weeks of pregnancy the first air sacs develop. More surfactant is produced as the lungs carry on developing. The blood vessels and lung cells develop and change to increase the amount of surface area available for oxygen to get into the blood. This prepares your baby’s lungs to breathe outside the womb.